Virginia Highland is located in Zone 6. To the north of us is Zone 2. To the northwest is Zone 5 and to the southwest and south is Zone 3. To the east of Zone 6 is Decatur and Unincorporated Dekalb County. 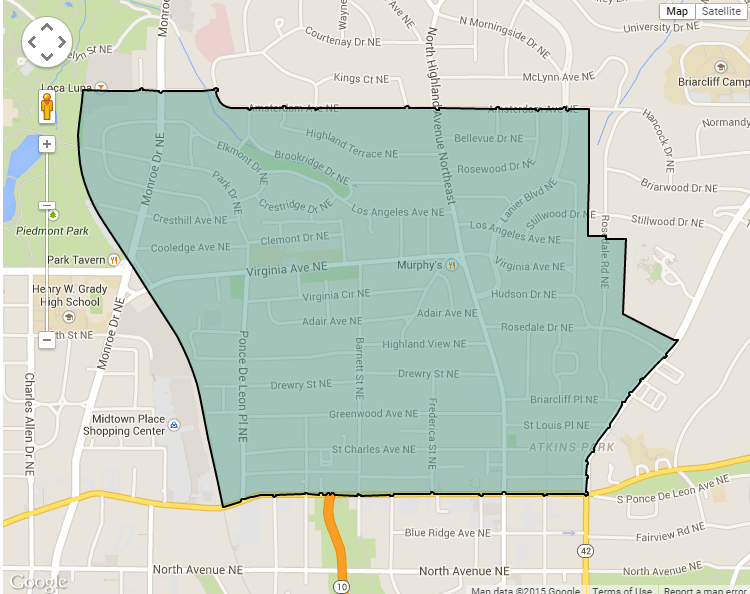 The zone is much larger than the neighborhood of Virginia Highland. It also includes such neighborhoods as Lake Clair, Kirkwood, Edgewood, Little Five Points, Poncey Highland, Old Fourth Ward, Inman Park, Grant Park, East Atlanta, East Lake, and Candler Park. The zone extends all the way south to the grounds of the U.S. Penitentiary on McDonough Blvd. 2025 Hosea L. Williams Dr. S.E. Our beat is #601 which has the same boundaries as the neighborhood of Virginia Highland. It is bounded by the BeltLine to the west, Ponce de Leon Avenue to the south, Briarcliff Road to the east, and Amsterdam Ave. to the north. There is a minimum of one officer per beat per shift assigned with a patrol car. However, because officers ride alone, our assigned officer might need to race to another nearby beat to provide backup to another officer in a dangerous situation.